Ω Corruption swims within Cynicism, as fattening fish within their nurturing sea. Ω "Live high and plunder" is the motto of the Permanent Political Class. Ω Glory unsettles place-holders. Cleopatra as both Queen and Goddess ruled the grain-fields of Egypt which fed the Roman Republic; it is no wonder that the steady Roman Senators feared her. Ω Modern clever Despots feign modesty and frugality; but the most ingrained Despots actually are modest and frugal, except as regards Power over others. Ω American Demagogues defining re-hyphenated Americans may profit mightily from Foreign Despots needing a divided and weakened America. Ω The Nazis, avowedly fighting a "total war", found time and resources to murder six million Jews and a hundred and fifty thousand Gypsies. When managing a modern State which does not provide Constitutional authority to note Citizens' Ethnicity and other Failings in its Census, the Despot must cleanse circumspectly and by Stages. Ω How many generations of outsourcing Manufacturing does it take to deprive a Nation of both Machinery and industrious People? How many generations of outsourcing Births does it take to deprive a Nation of educated and assimilated Citizens? — One generation, if done thoroughly. Josef Stalin, the Breaker of Nations, understood this. Ω Coincidence is a friend of the Politician; Ignorance is an ally of the Administrator. Ω Unintended Clarity may turn a burning lens of sunlight upon your darkest, safest Secrets. Ω Clean voting is critical to maintain a Republic: therefore if you dilute the one, you poison the other. Ω Voting is the best revenge of Democracy; vote fraud is the best revenge within Democracy. Ω Build Confidence in the voters' choice by counting votes carefully using the machine-politics procedure: lose and destroy wrong votes, create and find desired votes; keep counting until the favored candidate wins; stop, announce honest completion, and declare the victor. Ω "We're politicians: we don't need to show you no stinkin' records!" — In an era of media corruption and sycophancy, the safest way to be elected is to have no public record; the next safest is to hide it. Ω A politicians' dilemma: although foreign War diverts money from domestic Projects, it also diverts attention from domestic Malfeasance. Ω There are official thresholds for the amount of poisonous chemicals we can tolerate in our bodies; but few understand how bad Laws & Regulations poison Civilization. There are official thresholds for the number of insect parts, by type, allowed per pound of food; but such levels never are applied to the Thieves, Traitors, and garden-variety Blunderers infesting Bureaucracies. Ω Too often a people must be considered Fortunate, if their rulers merely are Contemptible. Ω If you murder people in a sufficiently outlandish manner, you may be declared insane: if a Citizen, losing your Constitutional rights but gaining immunity from execution plus lifetime support by the State; if an Autocrat, adding to your reputation for fearsome Eccentricity. How crazy is that? Ω No matter how spectacular the Portents in your sky, whether Lightning or Cyclones or secretive Craft, simply maintain that these sightings are Weather Balloons, of no concern to calm and law-abiding folk. Ω History is on the side of Truth; but conceal it as long as Expedient. Ω Citizens require knowledge of History, facts in perspective, to sustain their dynamic Republic; whereas a stable Autocracy nurtures Subjects who know little and safely may be allowed to converse in platitudes and insults. Ω Smile upon the Foolish, encourage and reward their ignorance; gather the Vicious, organize and reward their venality. Ω Captivate intellectually, or seduce emotionally, the gullible or venal members of Academia and the Press. Do this earlier rather than later, and the Legitimacy of your Usurpations will be defended by these lackeys, as yelping dogs running beside your Chariot. Ω Malfeasance in office may be disguised usefully as ignorance, incompetence, distraction — indeed, even any lesser crime. Vary and rotate your Excuses so as not to bore your Subjects. Ω When promoting or deprecating any Incidents in the controlled Press, note that one of them is more useful than the others. Ω For any Issue, hold both Deniability and Responsibility ready, one in each hand: so you may Shift back and forth between them as the Public Attention waxes and wanes. 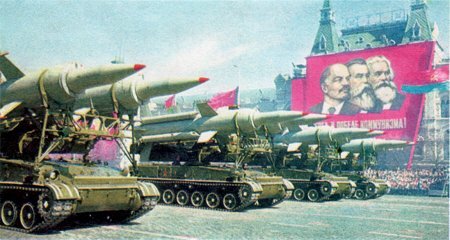 Ω The naive Masses must be trained to believe in rumors or accusations of Prejudices, Conspiracies, Crimes, and Treasons undermining the Despotism; whereas the Despot's lackeys must train the naive always to laugh at clear evidence of like plans and actions withering their remaining Freedom. Ω Aid and abet all dilution of, and disrespect for, cultural literacy: what every Literate Person knows about their Society and Nation. As this Twilight of Knowledge inevitably closes down the scope of Civic Discourse, so does a Nation proceed from its hopeful Day toward its commanded Night. Ω What cannot be said crisply in an aphorism, or developed concisely in an essay, or documented thoroughly in a treatise — may be blared in an avalanche of detail with exquisitely tangled logic, to the multitude. Ω Even the simplest History eventually is lost, as Big Lies and Quiet Soothings march in lockstep with Bewilderment and Indifference, all abetted by public Miseducation. Ω When "power corrupts", make sure that you are first in line. will be Installed or Preserved without due Consideration. to the best of my knowledge, are my invention. 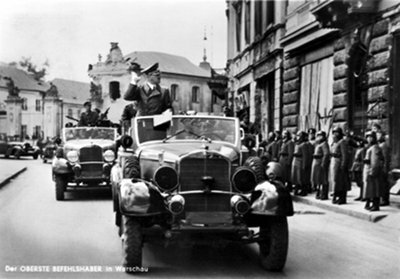 "The Supreme Commander in Warsaw"
Hitler on parade in occupied Poland. 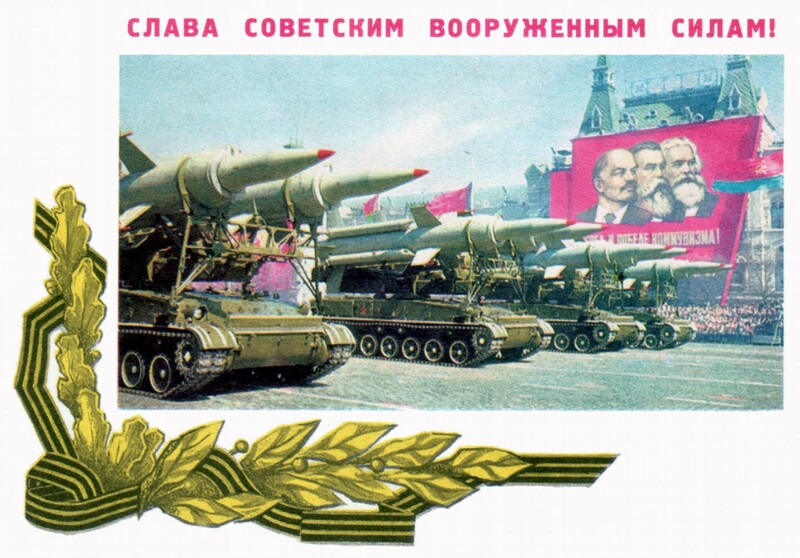 "Glory to the Soviet Military"
banner with Lenin, Engels, Marx. to March 8th, International Women's Day.